A lease with an option to purchase form is a document which is to be used by landlords and property owners who will allow their tenants to purchase or buy the property which is being leased to them. However, the purchase offer is only limited which means that the tenant must make a decision within the period when the offer was provided by the landlord. Nonetheless, the landlord, the property owner, and the tenant must negotiate if ever the offer is considered to ensure that all the concerns of each party will be addressed and needs will be met. 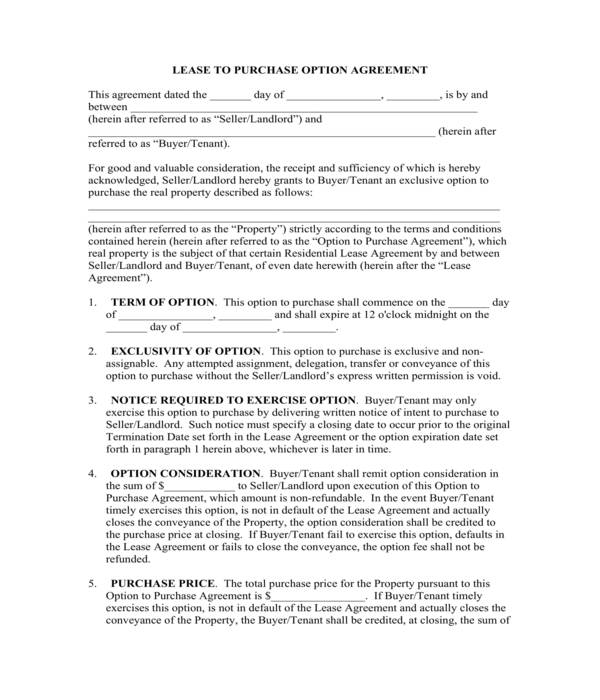 What’s in a Lease with an Option to Purchase Form? The description of the property and identification of the involved parties: The address of the property and the names of the buyer and the seller or the tenant and the landlord will need to be stated in the form. Moreover, the names of the real estate agent and the property owner can also be included if ever the landlord is not the assigned seller of the leased property. The term and exclusivity of the option: This section of the form will indicate the commencement period of the option offered to the buyer or the tenant of the property. It should state the starting date and the expiration date of the option or offer as preferred by the seller. In addition, an indication of whether or not the offer is exclusive to the tenant should also be specified as well as the rules in lieu of possible assignments and delegations of the tenant in accepting the offer. The option’s considerations and price: This is where the amounts to be paid by the buyer or tenant will be indicated. Specifically, the option’s consideration amount is to be provided by a tenant who prefers to consider the offer of purchasing the property however will not yet be buying rather will be reserving the property and having the landlord hold off the sale from the market. The purchase price, on the other hand, is the actual amount to be given by the tenant when he will be buying the property along with the deductible amount from his month-to-month rental payments. Closing and settlement clauses: These clauses are for informing the buyer or the tenant about the closing and the settlement fees to be paid to successfully transfer the ownership of the property from the seller. A statement regarding the financial obligations of the buyer should also be included especially in arranging and finalizing payments for purchasing the property. Remedies and modification clauses: Avoiding issues and conflicts is one of the reasons why a remedies clause is incorporated into the form. With this clause, the buyer and the seller will be able to identify what actions will be taken in the event that one of them fails to meet the responsibilities and obligations as enlisted in the agreement. On the other hand, the modification clause is for informing both parties about the necessity to have any modifications in writing for it to be legally accepted as an agreement addendum. 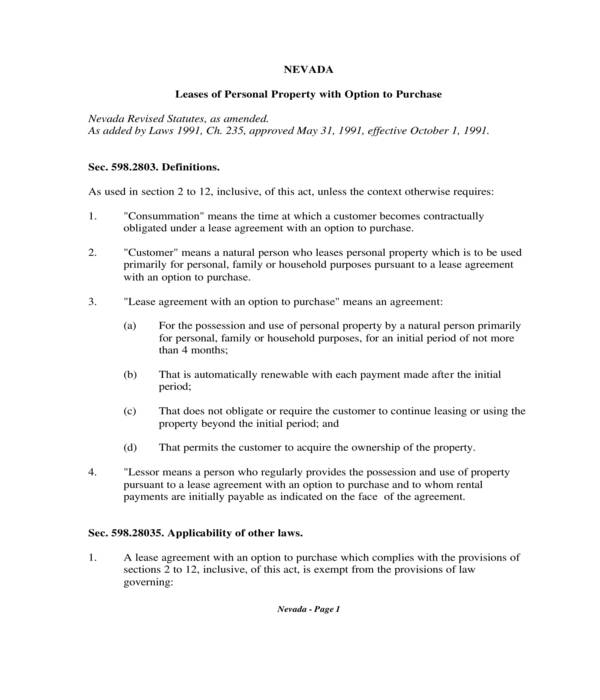 Acknowledgment and choice of law and venue statements: Basically, an acknowledgment statement is for documenting that both parties have read and understood the contents of the lease with an option to purchase form, while the choice of law and venue statements are for indicating the preferred County or State where the agreement will be executed. In addition, a signature block should also be in the form which is solely for collecting the signature of the buyer or the tenant of the property along with his name and the date when the agreement was signed. 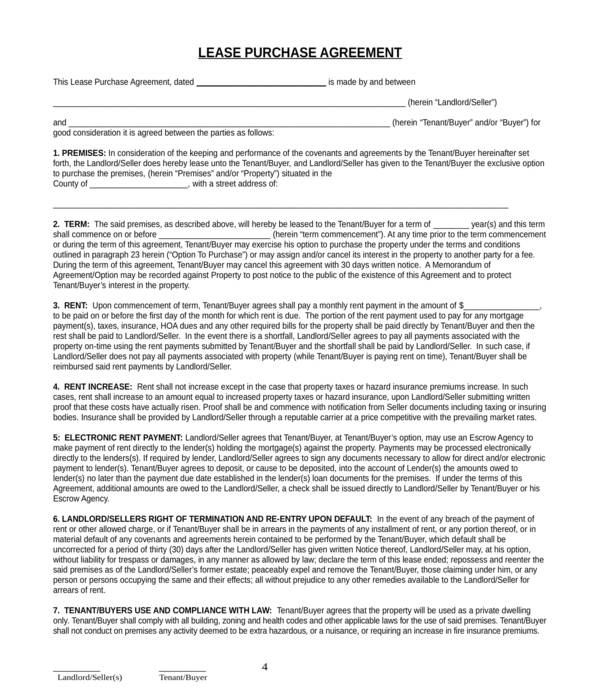 Manufactured Home Lease with Option to Purchase Agreement Form – Manufactured homes are less costly than regular homes. This is why there are individuals who have chosen to create a business out of making mobile homes and establishing parking areas. Furthermore, if a mobile home owner wants to sell his property to a tenant, then a manufactured home lease with option to purchase agreement form must be created and be provided to the tenant. 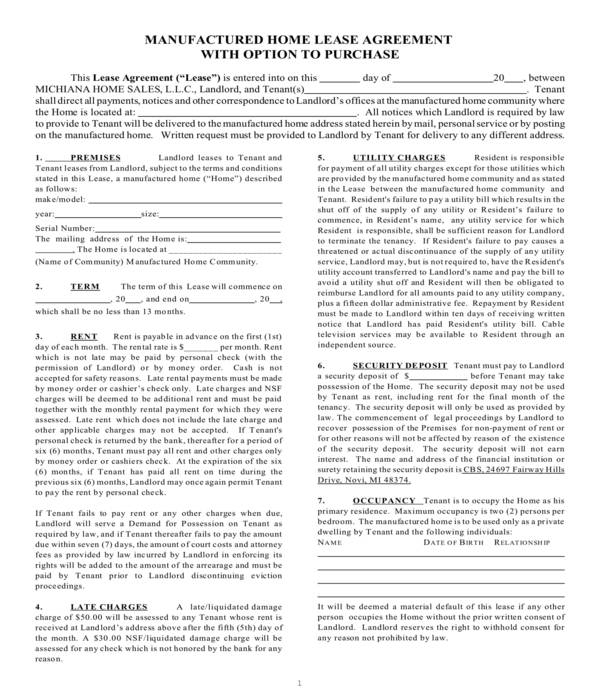 Real Estate Lease Agreement with Option to Purchase Agreement Form – This form variety has the same contents and terms to basic lease agreements, however, the difference is that it is intended for real estate leases. In addition, the form also contains clauses which indicate the rights of the tenant or the buyer of the property to sublet and assign the lease within the tenancy period, as well as the insurance that the property owner or landlord includes in the purchase option. 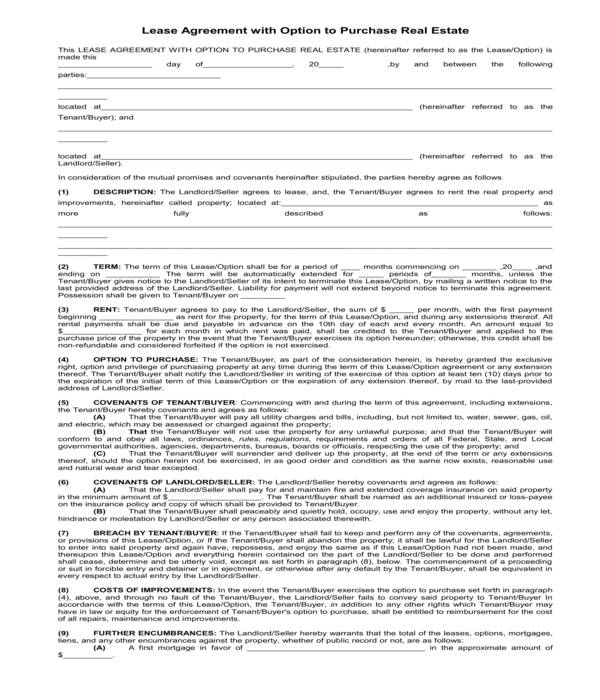 Lease with Option to Purchase Instructions Form – Compared to the aforementioned forms, this document is not to be filled out by a tenant or a landlord, not even the property owner, rather it must be read and understood to know the rules and regulations to be followed for offering a purchase option. The form enlists the laws of the State which must be obeyed by the seller of the property along with the violations and its corresponding penalties. 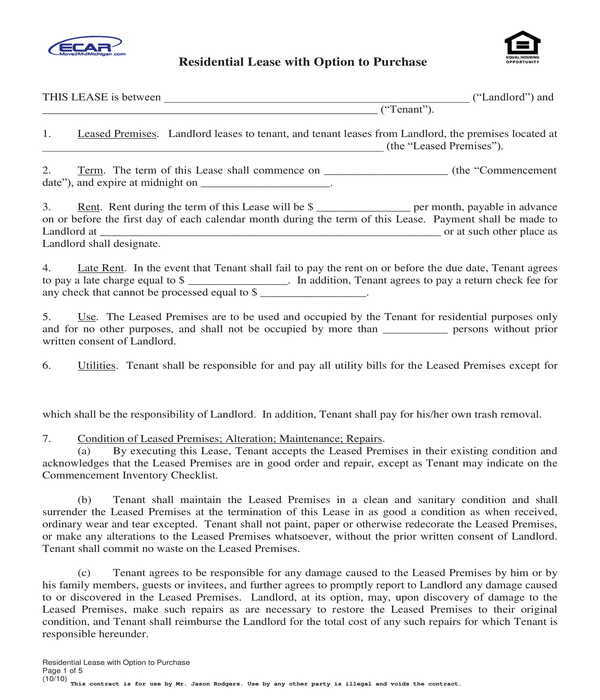 One of the benefits of using lease with option to purchase forms is it serves as an instrument or guide for the involved parties to towards what they must do, what each party expects, and what the limitations and violations are. Moreover, the form will also legally hold the involved parties accountable and liable for their own responsibilities, assignments, and obligations for as long as they are a part of the lease.